By the way, many of you are questioning whether or not you can jump in late on this ... and the answer is yes! Better late than never! Today ... and for the next eight days ... I am helping to try to give a child a chance at life. "Zhora is too cute! Zhora is short for Georgiy ... so don't be confused ... this is definitely a boy. He is healthy, except for a minor heart murmur, which should not require surgery. He is active, happy and playful! Note: The weather was so hot when this picture was taken, that all the boys had their heads shaved." Zhora is an orphan in Eastern Europe that was abandoned at birth -- most likely because he has Down syndrome. He lives in an orphanage where his basic needs are met, at best. 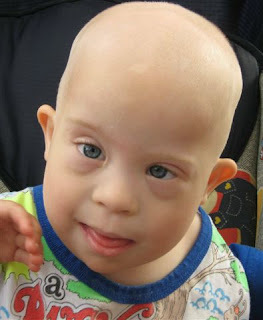 A few weeks ago, I was contacted by a friend that I met several years ago ... courtesy of something we have in common ---> a child(ren) with Down syndrome. My friend ... Lisa ... has a son that is similar in age to Payton. His name is Daniel. And he very much resembles Zhora. And for that reason ... Zhora weighs very heavily on Lisa's heart. And she wanted to know if she could use my blog as a means to raise money for Zhora and try to find him a family. There are hundreds of families that are emotionally ready to adopt a child with Down syndrome ... however being financially ready is a different story. Lisa's hope is that she is able to bulk up his grant fund at Reece's Rainbow ... so that it will increase his odds of someone being able to afford to bring him home. Right now, he has $835 in his grant fund. His adoption could cost upwards of $15,000 to $20,000 ... so he has a long way to go. We are asking for your help ... and in the end, we will be giving away an iPod Touch and a quilt to two people that donated! See below for more information on these items. 1) For every $10 donation, your name will be entered one time into the drawing. So ... if you donate $50 ---> then your name will be entered five times. 2) Every person who donates $35 or more at one time, will get a 2009 Reece's Rainbow Christmas Tree Project ornament. The ornament is porcelain and will have a picture of Zhora on the back. 3) Once you have donated ... you can earn extra entries by ---> 1) blogging about this, 2) posting it on your facebook, 3) tweeting about it or 4) emailing your friends and family about it (cc me at bethanybalsis@mac.com). Once you have done any or all of these, leave a separate comment here so your extra entries can be accounted for. 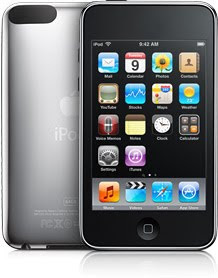 4) The deadline is December 15, 2009 ... and the winners of the iPod Touch and the quilt will be announced on December 16, 2009 ... just in time for Christmas! Remember ... your donations are 100% tax deductible! 2) Quilt ---> handmade by Mary, another friend whose beautiful daughter ... Anna ... has Down syndrome. Thank you so much for hosting this Bethany. You are so awesome. I am praying so hard for this sweet angel!!! I posted it in my facebook for you. I want to win the quilt! going to donate my ten dollars too, right now~! thats two chances to win the quilt! I hope this helps fill Zhora's account and gets him closer to an adoption! Just Tweeted and Facebooked it...will get a notice on my blog soon! He is so...adorable! I hope he will get adopted soon!! I facebooked it and tweeted it. oh, I mentioned this on my blog post today too.